I'm not sure there was any cardboard used in the TOS bridge. I know that of the three elaborate recreations I've walked on, there was little or none. I've yet to see a revision of the Trek sets beyond those designed in the 1980s that looks plausibly like a place that people would work, regardless of the amount of live graphics, etc. installed in them. BeatleJWOL, TrickyDickie, lawman and 1 other person like this. And it will keep sailing when those of us still alive in 2063 will wonder where our warp drive is. Trekkies with their repentant inability to separate character from actor, will no doubt resurrect the corpse of James Cromwell and demand he build one. Maybe she is the Chosen (Number) One? saddestmoon and Jesse1066 like this. BeatleJWOL, Turtletrekker, Hythlodeus and 1 other person like this. The post was talking about in 2063. LizStargaryen, saddestmoon, Yistaan and 1 other person like this. As much as Axanar is trash, I am fond of the one bridge set they actually made, it's like a cross between 'The Cage' and the early TOS movies. saddestmoon, Jesse1066 and Phoenix219 like this. I sure wonder where those android cops were every time Data griped about being the only android in the Federation in TNG (he even was going to reveal to his mom she was really an android so he wouldn't be alone anymore in that one episode). Obviously the leading Soong family member of 2233 decided to hasten android production once news of the Kelvin's destruction got out. This is the one who said "What is your name?" right? They should bring him in for Discovery, have him confront Number One and ask: "What is your name?" Then Discovery cuts to the next scene! 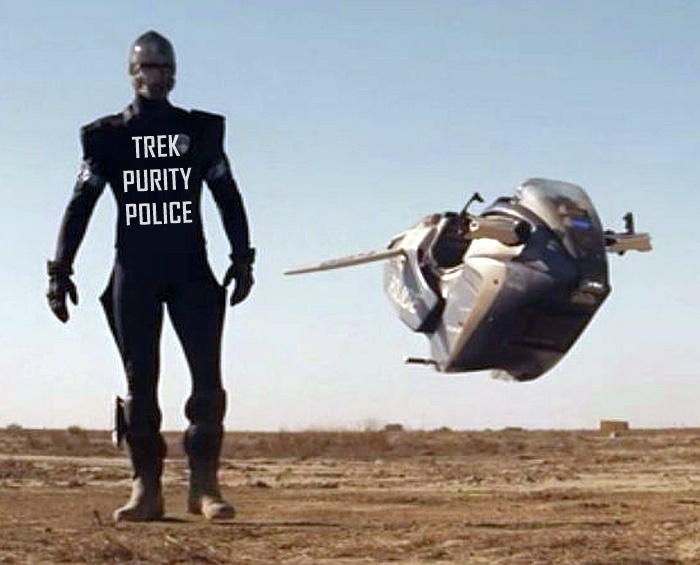 So even with Star Trek, we need to put an end to Police Brutality. - There's some debate on whether or not that's actually an android. The concept art says the faceplate is a "mask" which implies there was a person underneath (as does the need for a flip up visor). I'd prefer it to be an android since that's cooler, but just putting that out there. - There were also these guys from the background of sickbay in Into Darkness. According to a poster in this Reddit thread, Abrams supposedly said they were originally intended to be humans in the Special Features, but they looked weird, so they added some CGI faceplates. But I don't know that for sure. - It's in the Kelvinverse, so it doesn't necessarily apply to Data's history, even though it's taking place only a few years after the Kelvin incident so changes should still be relatively minimal (without getting into the whole Simon Pegg argument about the timeline changing both forward and backward through time). - There were lots of androids in TOS, so you'd have to deal with what happened to all of them anyway. Perhaps they fell out of favor, or there was a backlash against artificial lifeforms after the TOS-era because of some malfunctions or incidents much like the post-Eugenics Wars backlash against genetic engineering. A more benign version of the events of the anti-robot sentiment in the AniMatrix Second Renaissance segment (slightly NSFW animated video). - There were lots of androids in TOS, so you'd have to deal with what happened to all of them anyway. Not unlike our modern tech moguls, Dr. Noonian Soong obviously paid off or underhandedly wiped out his competition so he could be seen as the "creator" of android. Dr. Soong even tried to copyright the name android, but some tech company that began with a G got to the name several centuries before him. I think the name of the company that took on the android name was lost in the chaos of World War 3. They were all the rage back in the early 21st century though. In fact, Zefram Cochrane and other World War 3 survivors told the Vulcans that technology fights occurred between androids and apples, which puzzled the Vulcans greatly as they saw no androids around and apples seemed like non-sentient, juicy edible fruits. Highly illogical. BeatleJWOL, lawman and Phoenix219 like this. John Eaves literally said they had to change the design for legal reasons. This guy has been a fan for decades and has been trying his hardest to stay true to the legacy. Nothing pleases us. We have been a toxic fandom for literally decades. Nothing pleases us. We have been a toxic fandom for literally decades. Section 31 is right on thhh...oh, oh no. John Eaves literally said they had to change the design for legal reasons. Which has since been proven false. JoeP, Phoenix219 and fireproof78 like this. Yeah, it became Artistic Reasons, but we all pretty much know it was for Financial Reasons. CBS needs new merchandise to sell. Shamrock Holmes, JoeP, PiotrB and 1 other person like this.